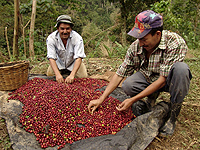 This lot is produced by a co-op called COCOSAM (Cooperativa Cafetelera Sanmarquena) from the southwestern corner of Honduras. In the cup is a smooth, silky almond flavor with a hint of red apple brightness intertwined with the soft flavors of a traditional Central American cup. A semi-sweet cocoa rounds out the cup giving it a satisfying finish.